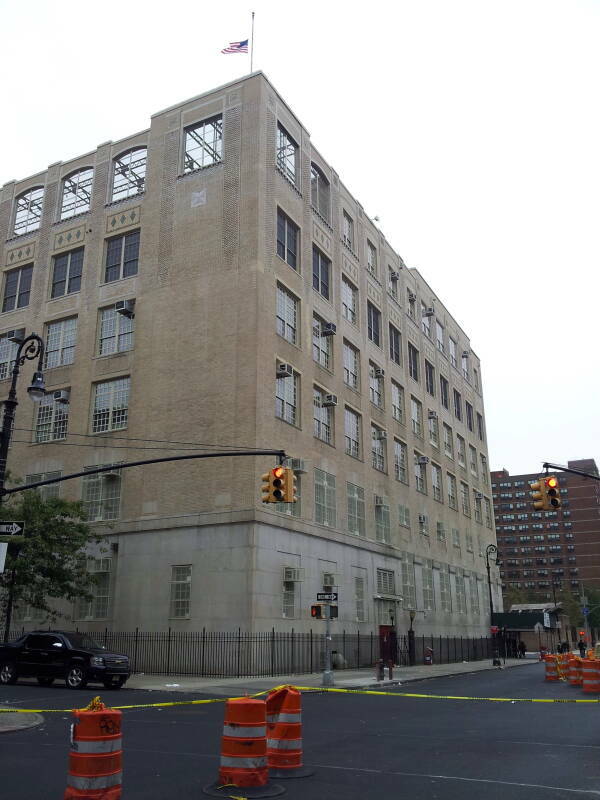 The Seward Park High School is built on the site where the Ludlow Street Jail stood from 1862. Boss Tweed, the head of the Tammany Hall organization, was finally convicted and sentenced for corruption. He was put in jail here and died in the jail in 1879. The jail was demolished in the 1920s, and the school building was completed in 1929. Alumni of the school include Nobel Prize winner Julius Axelrod (specialist on neurotransmitters and the pineal gland), Walter Matthau, Bernard Schwartz (or Tony Curtis), Samuel (Zero) Mostel, Jerry Stiller, Keenen Ivory Wayans, Luiz Guzman, and the Soviet spy Julius Rosenberg. It's at 350 Grand Street. 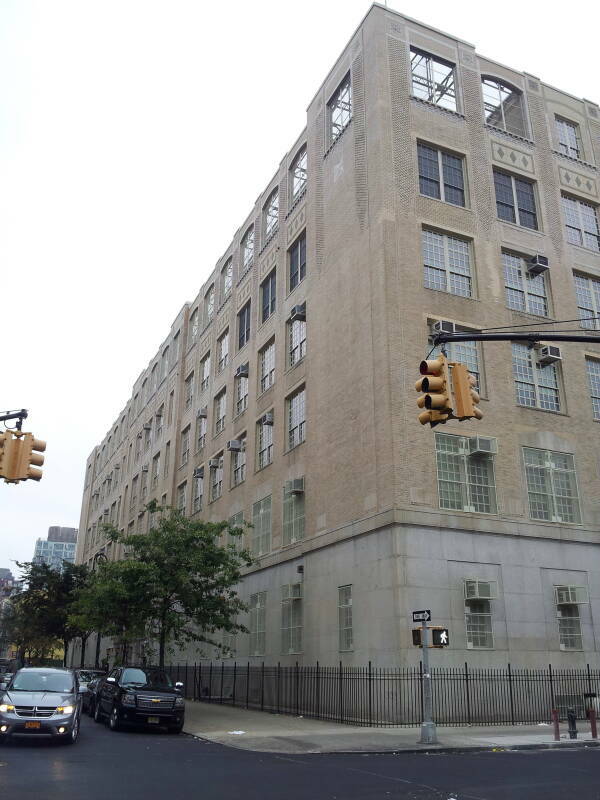 Seward Park, 350 Grand Street at Essex Street. Biały is Polish for "white". The character Ł is pronounced as "W" is in English. A bialy, really a biały kuchen or białystoker kuchen, is a traditional dish in Polish-Jewish cuisine. That's the Yiddish name, back home in Poland it's called a cebularz. It originated in the Polish city of Białystok. 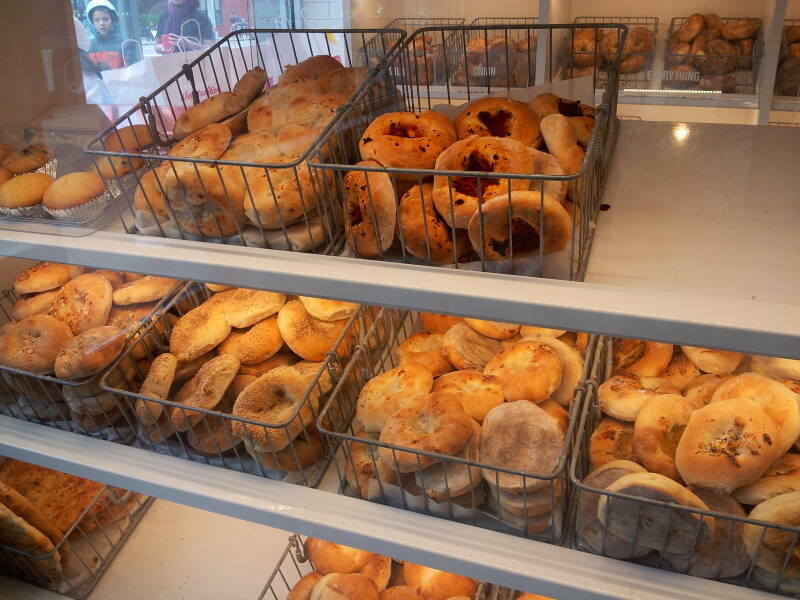 A bialy is similar to a bagel, but instead of a hole there is a depression filled with ingredients such as garlic, poppy seeds, chopped onions, and other toppings. 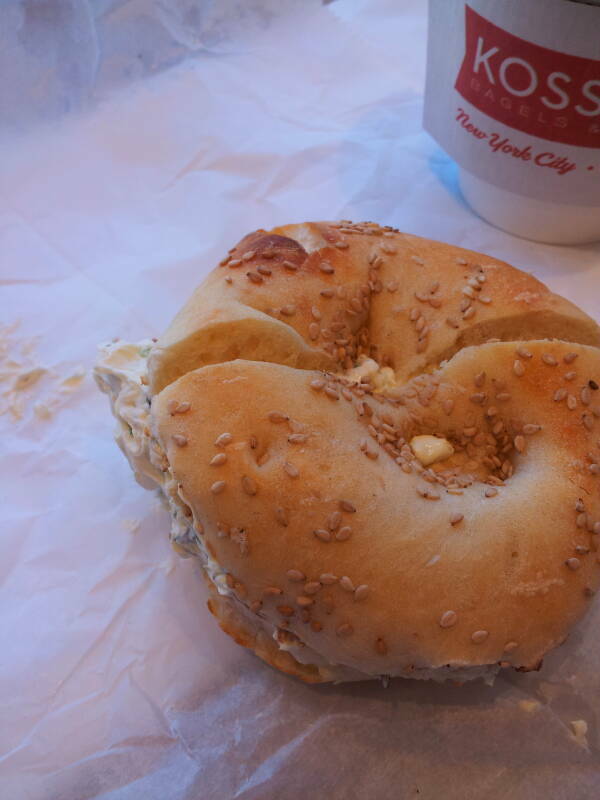 Topologists notice that a bagel is homeomorphic to a coffee mug, while a bialy is homeomorphic to a saucer. A bagel is boiled, while a bialy is baked. 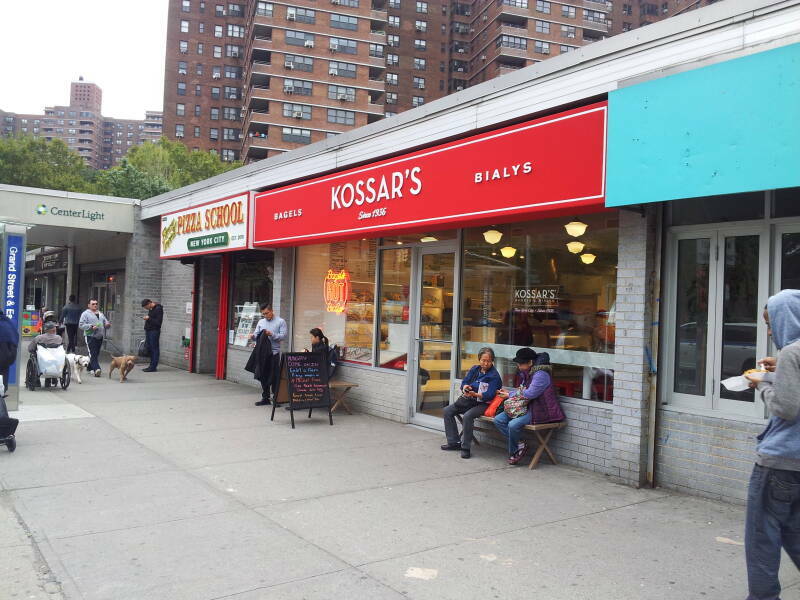 Kossar's Bialys is the oldest biały bakery business in the U.S. 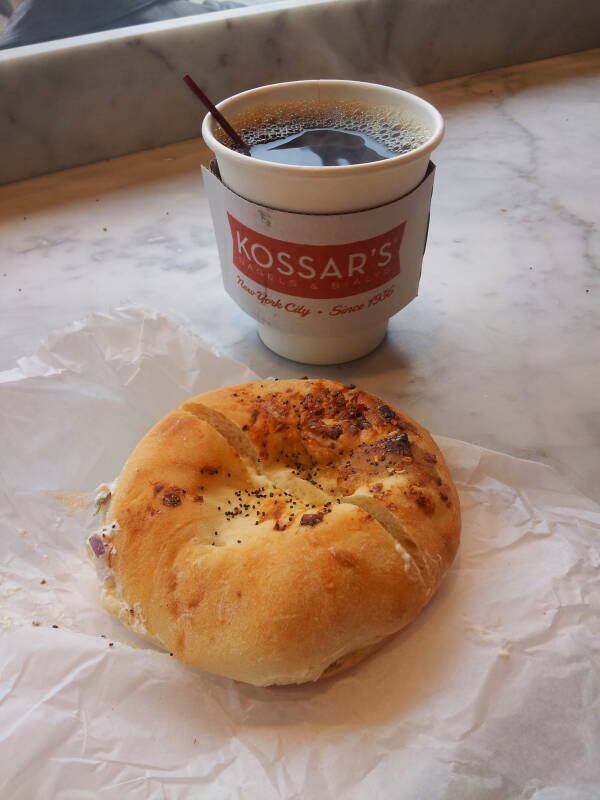 It was founded as Mirsky and Kossar's in 1936, when it was on Clinton Street. A union dispute and fire destroyed the building in the early 1960s, forcing the business to move to its current location at 367 Grand Street. It has changed hands recently, in 1998 and again in 2013, but is generally considered to be a continuation of the original business continuing its traditional recipes. Beth Hamedrash Hagadol Synagogue or בֵּית חַמִּדְרָש חַגָּדוֺל, the "Great Study House", is another abandoned synagogue. It was built in 1850 as the Norfolk Street Baptist Church. The Beth Hamedrash congregation was founded in 1852. Its founding rabbi had just immigrated to the U.S., and was the first Eastern European Orthodox rabbi serving in the U.S. 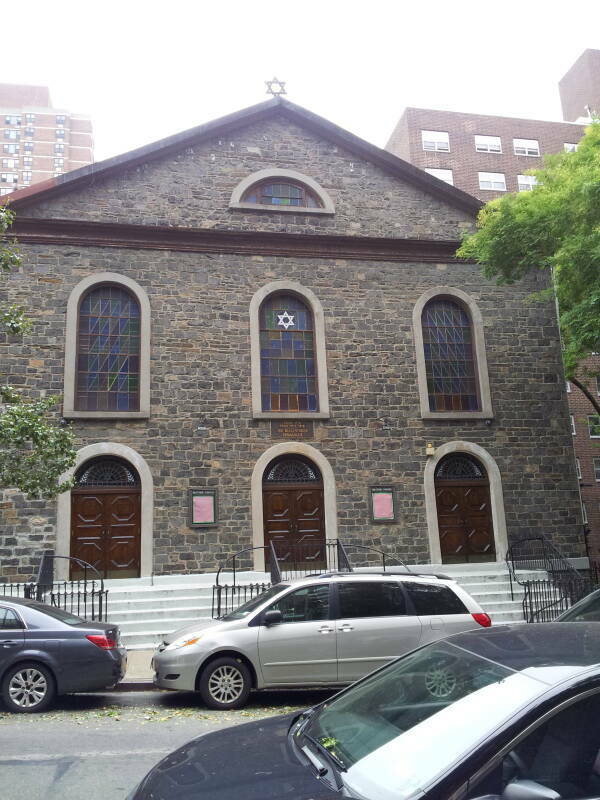 The German Jewish residents then dominating the Lower East Side were too assimilated and non-traditional in the eyes of the rabbi and his congregation made up mostly of recent Polish immigrants. 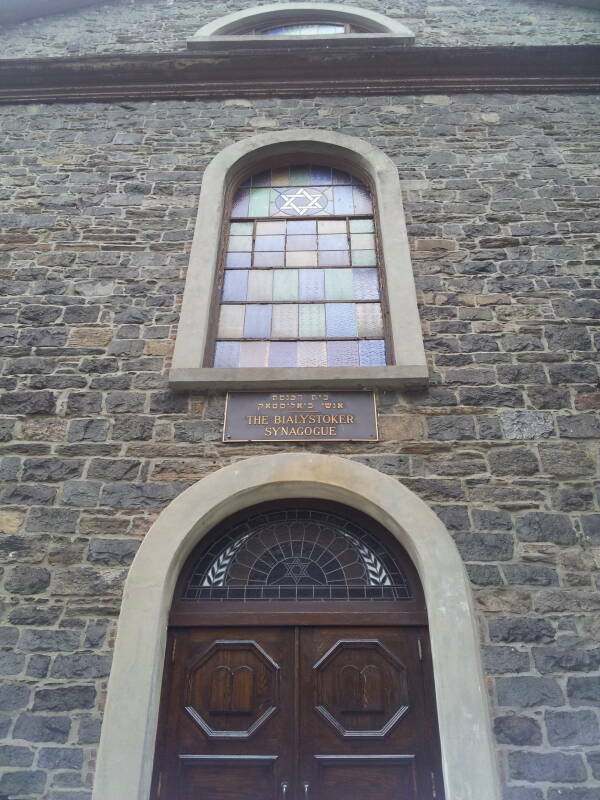 They moved frequently in their first years, until they were able to purchase a Welsh chapel on Allen Street in 1856. 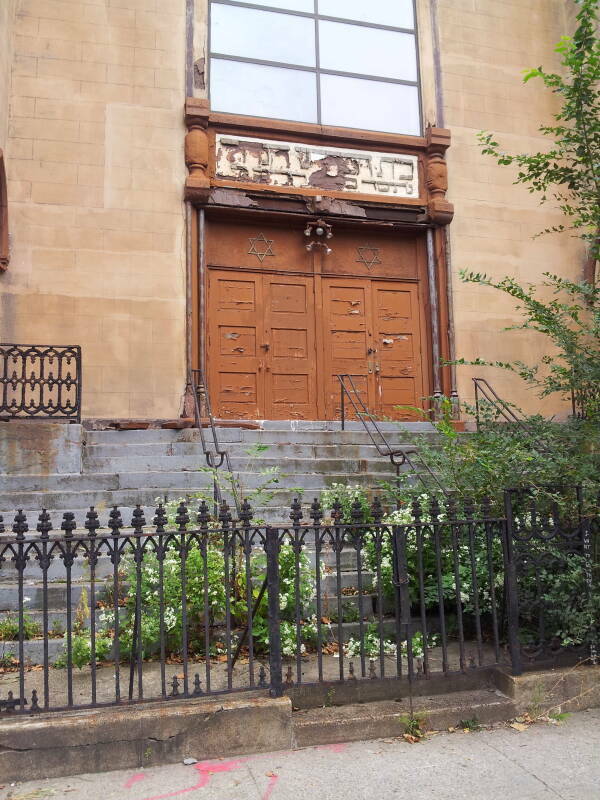 Beth Hamedrash Hagadol Synagogue at 60-64 Norfolk Street. Eastern European Jews began immigrating to the U.S. in large numbers in the 1870s. They came from the Russian Empire, where they had been excluded from society. Religion in general and the synagogue in particular were dominant in their lives, much more so for them than for the Jewish immigrants from Germany who were both linguistically and socially very different. Beth Hamedrash became the traditional, literally Orthodox, model for Eastern European immigrant Jews. There was a schism in 1859 over who was in charge. A majority left the Allen Street group, adding Hagadol (or "Great") to their name. 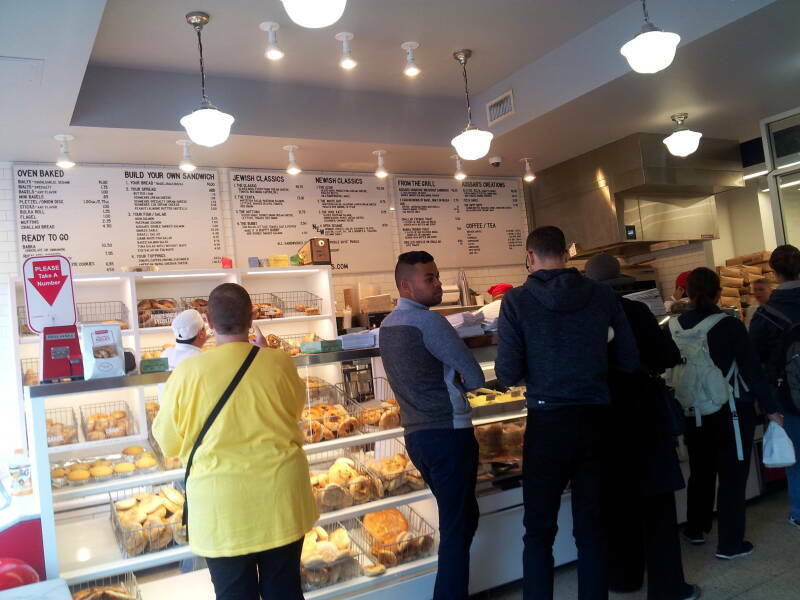 Their services were informal but they were absolutely rigid on dietary laws and other regulations. 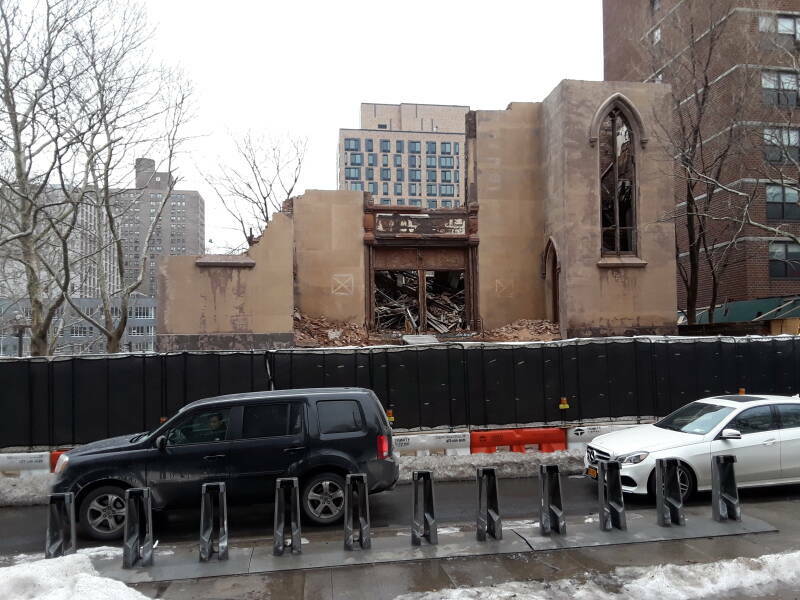 Meanwhile, the Baptist congregation that had built the large church at 60-64 Norfolk was shrinking as their locally-born Baptists moved out of the neighborhood while Irish and German immigrants were moving in. A Methodist Episcopal Church congregation bought the building, and went through a similar brief increase and then decline. 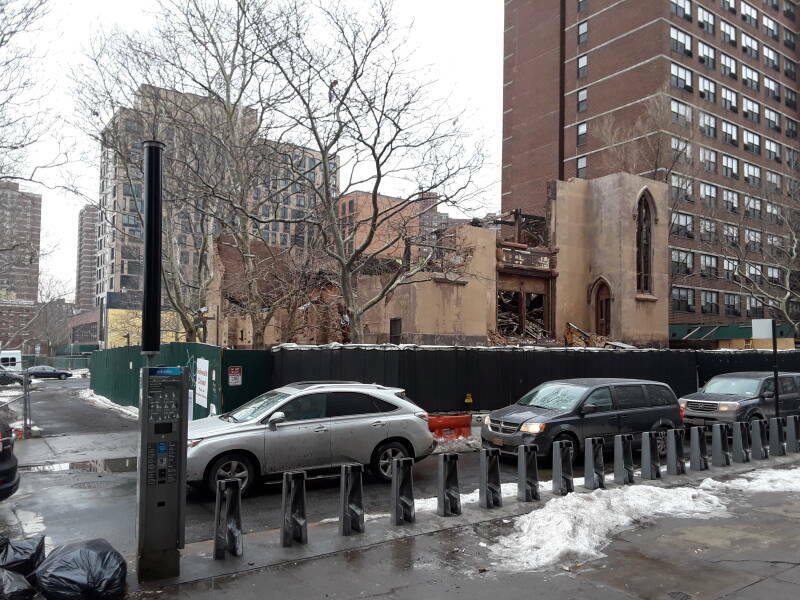 The building was bought by the same Church Extension and Missionary Society that owned the First Roumanian-American Congregation synagogue building for a while. 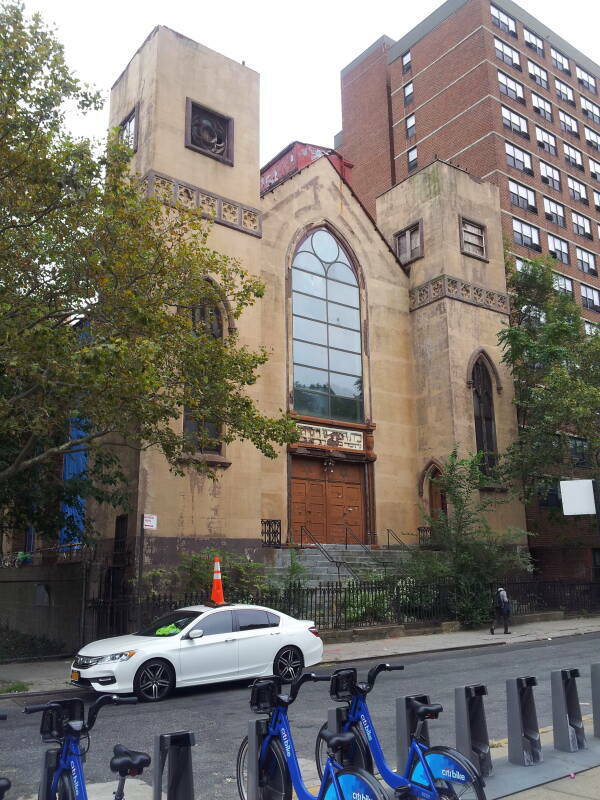 The project to convert Jews to Methodism didn't work in this neighborhood, either, and they sold the building to the Beth Hamedrash Hagadol congregation in 1885. They turned it into one of the largest synagogues on the Lower East Side. The congregation shrank through the late 20th century. In the late 1990s, with the congregation down to about 100, major damage began going unrepaired for months at a time. A fire and the fire-fighting efforts caused major damage in 2001. It was put on an official list of endangered historic sites in 2003. By 2007 the congregation was down to about 20 members who were sharing a facility with a congregation on Henry Street as the building sat unused. In 2011 the New York City Buildings Department issued a vacate order. 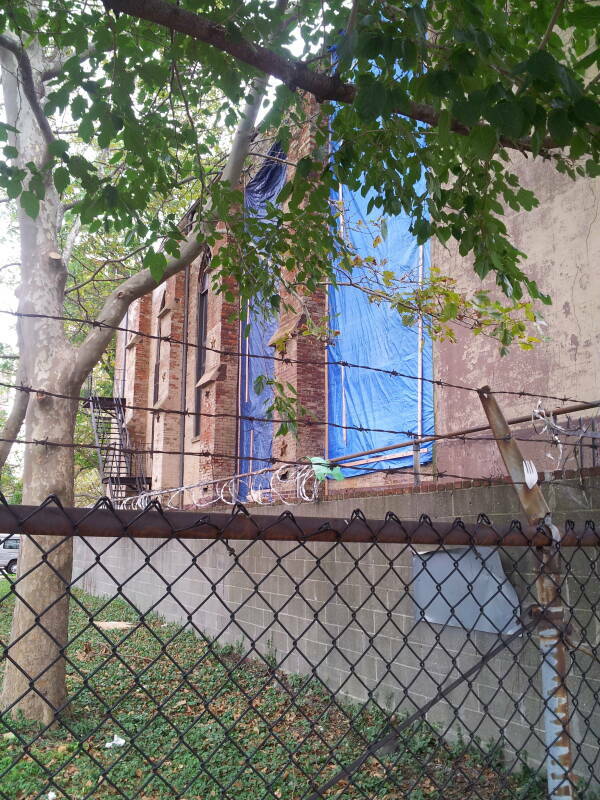 The Lower East Side Conservancy was trying to raise money for repairs. 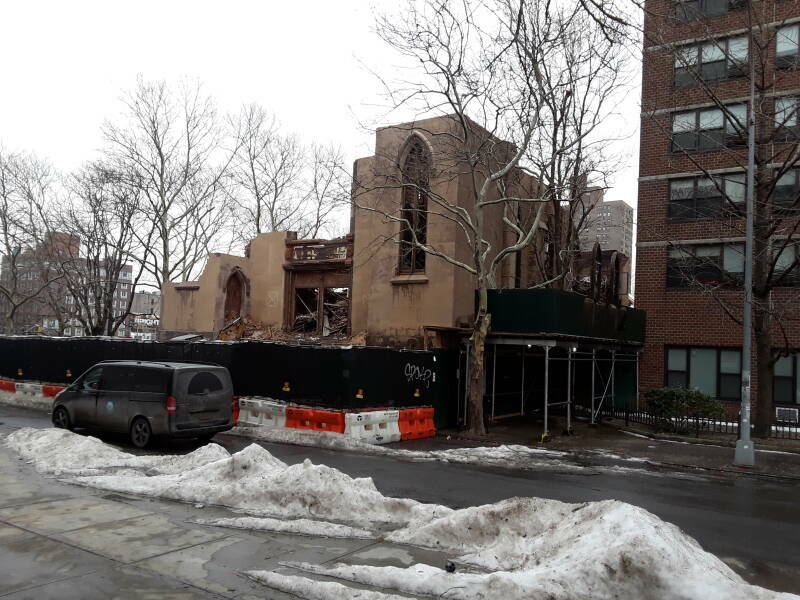 In 2012 the synagogue's leadership asked for but did not receive permission to demolish the building and construct a new residential project. 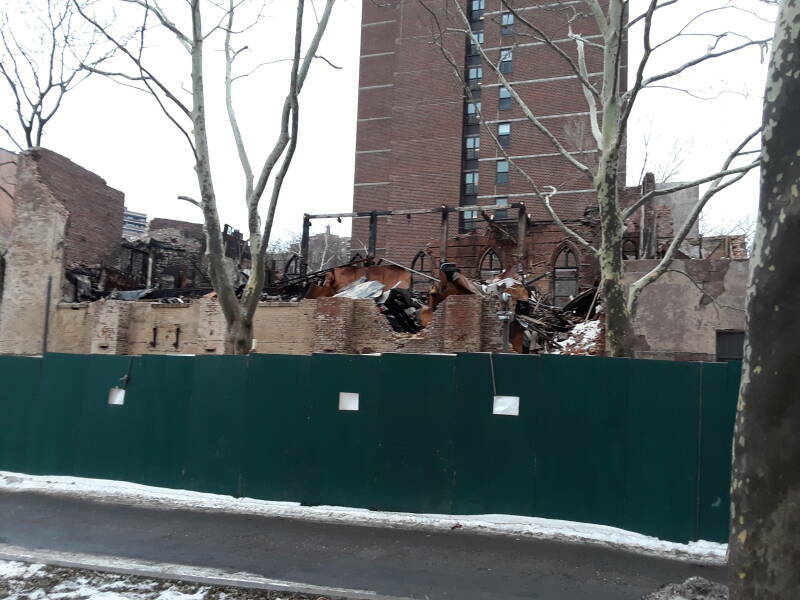 The Friends of the Lower East Side described the situation as "demolition by neglect." The above pictures are from October, 2016. In January 2018, the building was finally being demolished. Białystoker Synagogue was built in 1826 as a Methodist church. It was a stop on the Underground Railroad, sheltering escaped slaves on their way to Canada. New York City is well north of the slave-owning states that split off into the Confederate States of America during the Civil War, but many New York businesses relied on the products of the slavery system, especially the abundant cheap cotton used in the clothing industry. The led to New York City being surprisingly pro-southern and thus pro-slavery. Białystoker Synagogue at 7-11 Bialystoker Place, formerly Willett Street. A congregation of Jewish immigrants from Białystok in Poland, within Imperial Russia at the time, purchased the building and converted it into a synagogue in 1905. Their congregation, Chevra Anshei Chesed of Białystok, imported a three-story ark and painted the ceiling with zodiac symbols of the Jewish calendar. 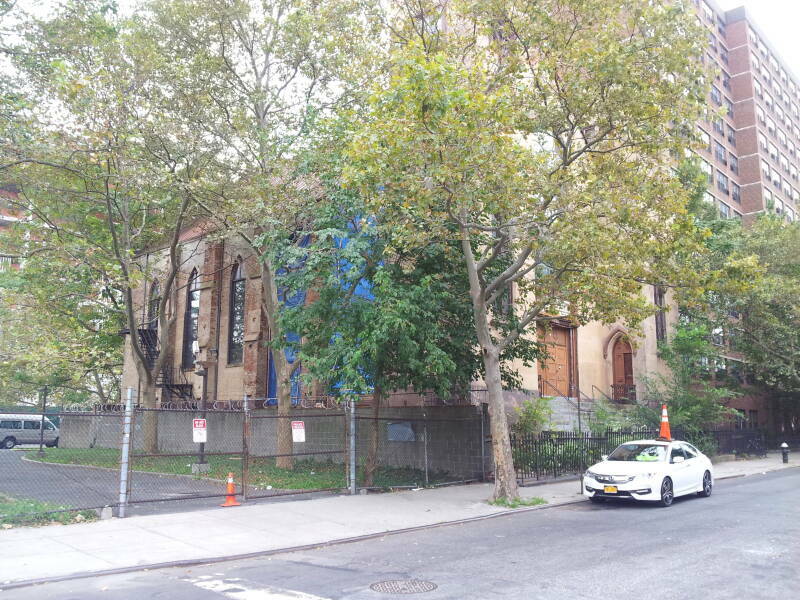 The synagogue is still quite active as it's on the northern edge of a Hasidic neighborhood.